Did you not honestly read this? He’s interfacing to the push-button on the garage door. Which assumes all the doors existing pressure and obstruction sensors are in place. By your logic, an aftermarket replacement button is “unsafe”. I’m interested in working on this project although I see there is a severe lack of open source code. I checked out your github repo and the app folder is actually empty. I am unable to find any up to date PCB files for EAGLE and quite simply cannot commit time to help unless these crucial assets are made available. I understand if you have changed your mind and have decided to not open source your project but if this is your intention you might want to update your site to reflect this. Good luck with your project, please let me know if you decide to make available the complete projects technical assets, I would like to help you make this better. Did you actually read the blog post or watched the video? The app is a Blynk app, so all you need is to scan the bar code (see link in the blog post) in Blynk. There is no standalone app yet, the github folder is reserved for a standalone app for the future, hence it’s currently empty. Also, what do you mean there are no up to date Eagle PCB files? They are right there in the opengarage-hardware repository. I don’t want to sound cocky, but if you are questioning the open source nature of this project, make sure you have read the project details before drawing your conclusion. I am not sure how I can make the resources more obvious. Can you give some description of what the “Security+ 2.0 adapter” $30 option is? The blog post only talks about interfacing to a compatible door button; I’m assuming it’s one the user already have. Hi Kris, the adapter is basically an off-the-shelf security+ 2.0 door button, with 4 wires soldered from the circuit board. If you have soldering skills you can get this door button yourself. 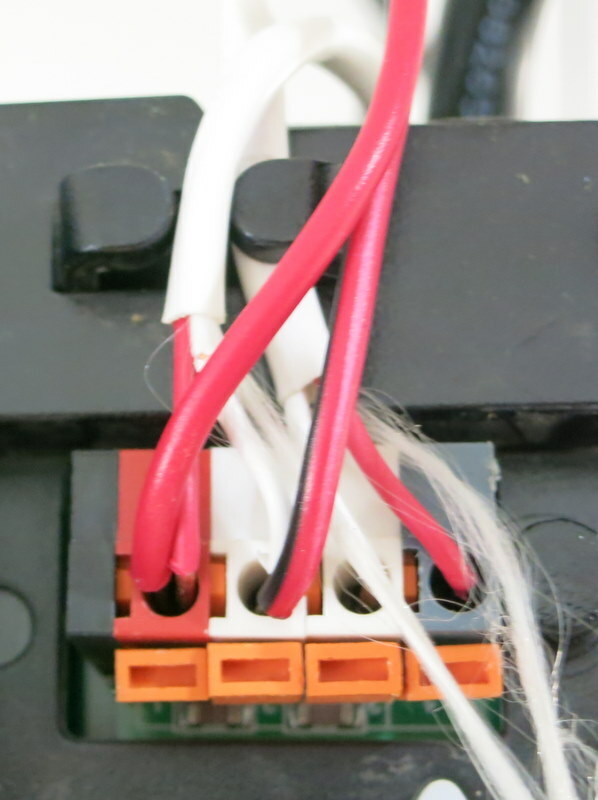 Two wires (soldered onto the tactile button) go to OpenGarage, and the other two wires (door button wires) go to your garage door opener. 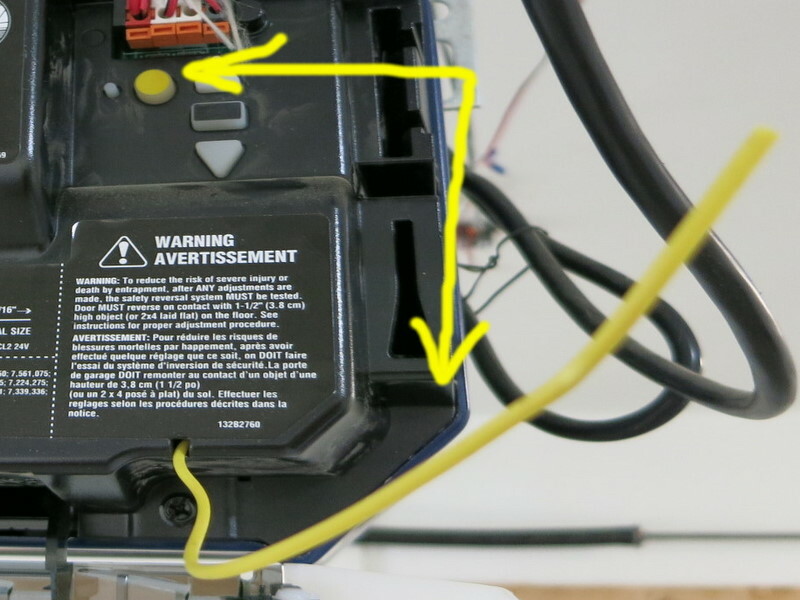 This way, when OpenGarage’s relay clicks, it essentially triggers a click on the tactile button, which in turns sends security+ 2.0 signal to the garage door opener. If you already have such a door button, or a remote, you don’t need to buy an extra, you can solder wires to your existing button or remote, as the video shows. 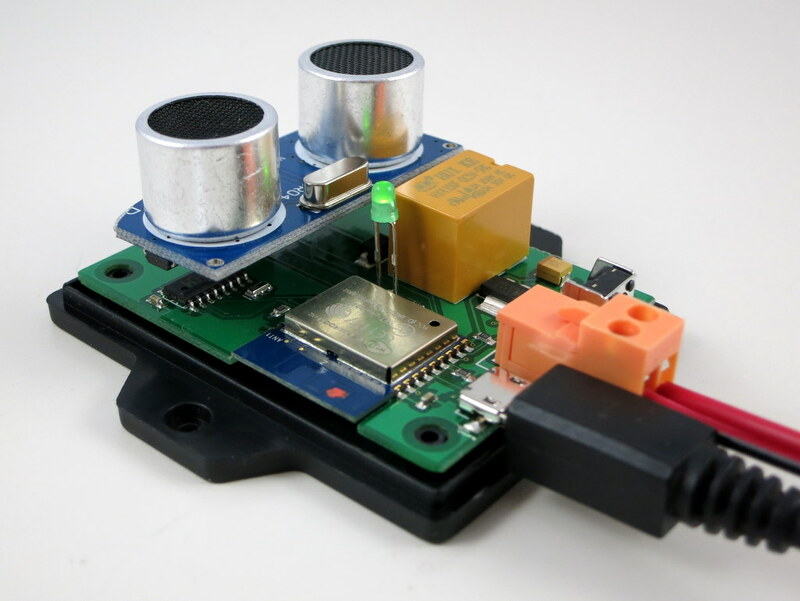 Because OpenGarage is meant not only for makers but also average users, we offer the adapter (with wires pre-soldered) as an easy-to-use option. Hi Ray, that’s my guess once I started thinking about it and you basically said that in the blog. Thanks! No plan yet. At the moment if you want to control two garage doors, you will need two separate OpenGarage controllers. I would love to see a Remote Distance sensor added to this project for the purpose of detecting the presence of a second car in the same garage (single door/two cars). What type of remote distance sensor do you have in mind? Received my hardware today, thanks. Has anybody interfaced this to ThingSpeak? Not yet. 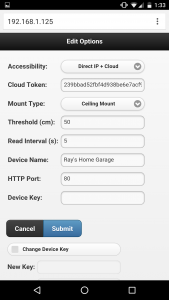 We’ve received some requests to get OpenGarage supported in OpenHAB etc. I haven’t had time to take a look at the integration yet. Ray – think you should capture this as it is rock solid. Have had it working on Openhab 1 and now Openhab 2 using the HTTP binding. Good to know that. Thanks! Hey Gordon, you said you managed to get this working on openHAB2 through HTTP binding. Can you confirm if this is still working and it is the same configuration as what Peter says above? Can the same garage door controller be operated by the Blynk application installed on two different phones? For example, can a husband and wife both have control of the same garage door? Yes, it can. There are two ways: one is to use a shared Blynk account. You can log in to the same account in different devices, and you will see the same projects. For example, I have installed Blynk on my cell phone and iPad, both work just fine and I received notifications on both. Another way, if you don’t want to share the account, is to use Blynk’s ‘Shared Access’ feature. This way, your spouse does not need to log in to your account, but can still access the same device. I received my hardware yesterday. Installed in 10 minutes. Got hung up briefly getting Blynk to respond (needed to do another reboot). Wrote a quick python script to interface with the OG webpage so I can just run a cronjob on the RaspPi and never worry about going to bed with the garage door left open. @Darrell, I installed on a phone and tablet and both work, so it does work on multiple devices. I am one of the lonely crowd using a windows phone which does not have access to the blynk app. Can I use port forwarding and still have remote access using the web interface? Well… I got the device installed today and unfortunately, the interface with two different windows 8.1 phone browsers does not work very well. It does not “read” the button push most of the time. It works just fine with explorer on my android device as well as the blynk app on the android phone. After I power up the module, I do not see any wifi network starting with OG_xxxxxx. I have tried resetting to factory default also. What could be wrong? Is the LED blinking at about 2Hz? If so, that means it’s in AP mode and it should create a network. If it’s blinking slowly (like once per 2 seconds), it’s trying to connect to your router. If it’s not blinking at all, that suggests there is an error. Have you ever thought about adding a DHT22 sensor. When the garage door remains open too long in cold weather in winter the door could close automatically. I have thought about adding a temperature sensor (not DHT22, but something simpler like MCP9700) but in the end I feel it’s not that useful so didn’t include it. I have one more question. BLYNK works with blocks of energy. What amount of energy Opengarage needs? when I scan the QR code Blynk ask me to add energy. I believe $1 is all you need. I guess there is no need now to answer any of my previous three questions. I broke down and gave up my windows phone and got an IPhone like everyone else. First this is a awsome website with lot of great informations. 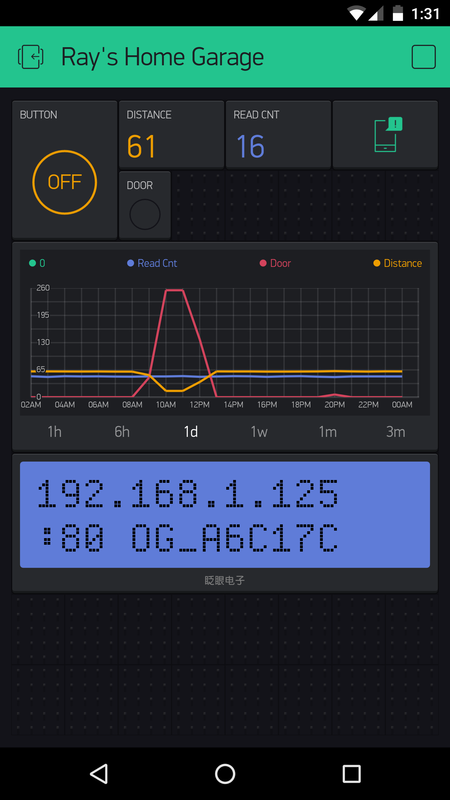 I tried to load the Open Garage Example on a ESP8266, flashing the device works. When the controller restarts I always have the following log message. Have you am idea what’s wrong? We did receive a few reports of similar issues, where the firmware crashes and repeatedly restarts. The solution, oddly, is to flash the controller with the nodemcu firmware first, then re-flash it with OpenGarage firmware. I have no idea why this works, and it was a purely co-incident that I found the solution. I suspect is has something to do with the flash memory space not initialized properly. In any case, use esptool.py to flash a nodemcu firmware (for example, nodemcu 0.9.6 firmware). Once that’s done, re-flash the OpenGarage firmware, see if this fixes the issue. Unfortunately, it didn’t work. 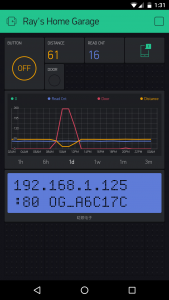 I used the nodemcu flasher (https://github.com/nodemcu/nodemcu-flasher) to download the nodemcu firmware, not the esptool.py. I think that should not be the problem? When I try some examples, which comes with ESP8266 core for Arduino (for example AdvancedWebServer), the module works fine. Do you have an idea what’s wrong? I just remembered to ask you this: do you have an ultrasonic distance sensor connected to your board? Note that OpenGarage firmware assumes there is an ultrasonic distance sensor, and if you don’t have one, the read_distance function will time out, triggering watchdog timer reset. The easiest solution is to go to OpenGarage.cpp, read_distance_once() function, return 0 or some constant right at the beginning. This will avoid it triggering time out. When i compile in audrino i get this error. I have tried both 1.6.5 and 1.6.8. Any idea what the issue is? i didn’t see an Updater.cpp on GitHub. Im looking to test the API on an esp8266 before purchasing. Hmm, I’ve never seen this error about ‘_async’. Updater.cpp is part of the esp8266 core, and is not part of the OpenGarage code. Depending on how you installed Arduino — if you installed the stock Arduino and then installed the esp8266 core, then generally the files are in a folder named Arduino15. If you installed using the makeEspArduino: https://github.com/plerup/makeEspArduino, then it’s in the installation folder. In any case, if you do a global search of Updater.cpp you should be able to find it. I am getting the same updater.cpp _async error. Any luck on fixing this? I am using a Wemos d1 mini. I wonder if this has to do with the ESP8266 core version. The one I am using is 2.2 I think and the latest is 2.3. Can you try to switch to version 2.2 and see if the error still persists? 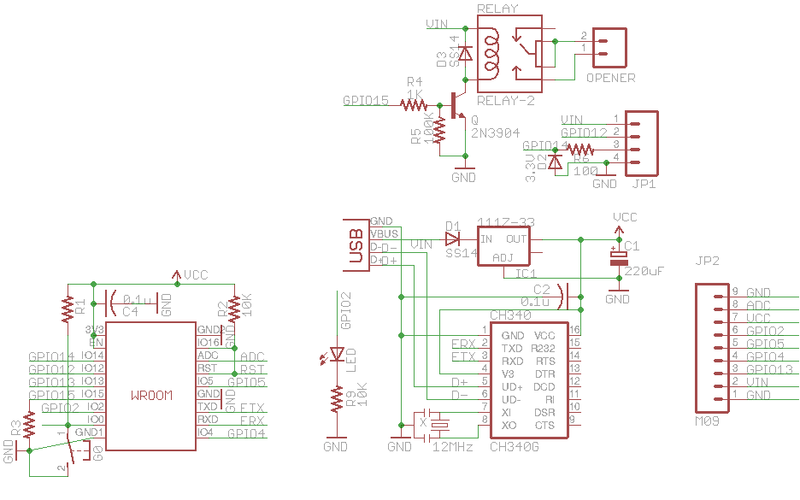 Ray, i do not have the hardware in front of me at the moment, but when using esp8266 core 2.2 and doing the modifications to blynk and updater.h the sketch now compiled without any errors. I will try this on the hardware when i get home and report the results, but i do think this fixed the issue. Thank you. OK, that’s good to know. Thanks. 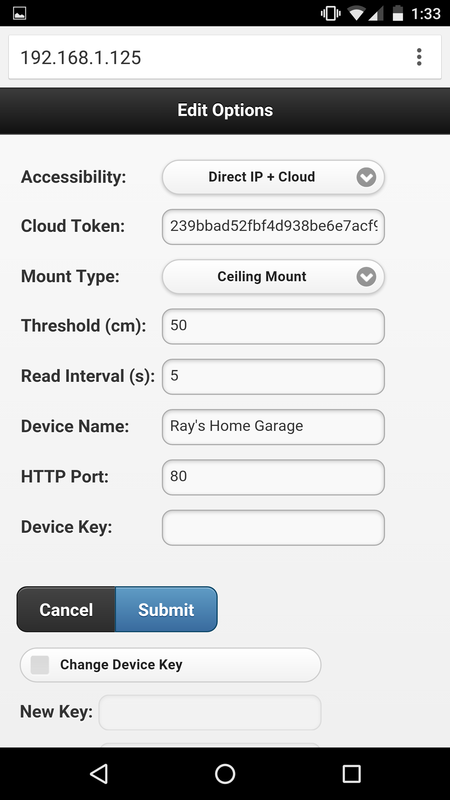 Ray, i tried it on the hardware and it worked, it showed up as an AP and i was able to connect to it and enter my wifi details. I still don’t have the ultrasonic sensor hooked up yet, it just came in today, i went with a 3.3v model to avoid having to use a voltage divider. Thanks again for your help. I have the same compilation error: ‘class UpdaterClass’ has no member named ‘reset’. I have the updater.h modification file, but I don’t know where to put it. I do not have an esp8266/x.x.x/cores/esp8266 folder and a global search does not find a current updater.h file installed. I installed the esp8266 v2.2.0 via the Arduino 1.6.5 Boards Manager method, which works for all my other esp8266 projects. Could this be the issue? How do I install the updater.h file? Love this project, please help. Not sure if this makes a difference: but it’s Update.h with a capital U, not small case u. After few test everything was ok. But now the led is always on and i can’t do nothing even reset. How can i resolve my problem. Hi, I ordered your kit and it’s just arrived. It looks to be working correctly thank you. I’ve set it up following your videos and everything worked correctly. I’ve run into a small problem installing it – I can’t get a reliable wifi signal as far as the garage. Is it possible to run it without an internet connection? E.g. opens when phone gets within wifi range? I’m planning to run ethernet to the garage at some point via powerline, so I could potentially accelerate that project and add a wifi adaptor but it feels a bit messy – it would mean I’ve got the unit, the powerline, my generally dodgy internet connection and the phone – lots of things to go wrong. to help extend the WiFi range. I received the kit and had it configured within 10 minutes, and installed and working in 30 minutes. Brilliantly simple and effective, thanks for a great product! 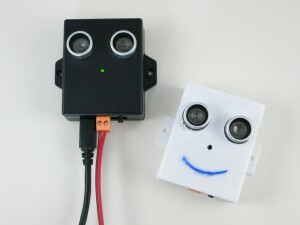 I just received the open garage but when I plug it in I hear 3 tones repeating and the LED blinks once every two seconds. The OG_xxx wifi does not show up. When I press the button for 5 seconds the led stays on constantly. Any ideas on what is going on and how to reset it? I have the same problem, did you get any support about that? Thank you. For technical support questions, please send email to [email protected]. Let me know if this helps. You can also send an email to [email protected] and we will get it sorted out right away. I try to find a system which allow me, to just hold my phone (sitting on my bike) to a certain point (like NFC sticker), and then the garage opens. The idea with your great opener: stick a NFC button somewhere near the garage door, take my phone out of my jacket, place it near to the nfc sticker, start with tasker thze blynk app and open with that task the door. So i need something like a “autorun” command, which directly opens the door when you start the app. Is this possible ? Or have anyone a better solution for my “bike” scenario? I live in Arizona. What is the maximum temperature that all components can operate and not fail? The side of the door moves up and down a track when the door opens – surely cables moving would risk entanglement over time? Or am I missing something? If you google image search ‘roll up garage door’ you will find plenty of examples. 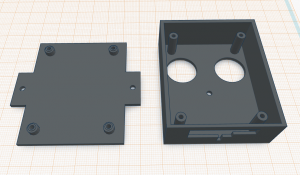 Mounting on the side does not mean mounting the controller on the door — you can mount it at a certain distance, say, 20 to 50 centimeters away from the door. I was meaning any photos of an OpenGarage mounted to a rollup door. This type of door have a track/guide on each side running the length of the door. Anyhow, I’ll take photos of my installation once my OG turns up in a couple of weeks. Received my OpenGarage in the mail yesterday, and got it configured this morning. Even though our garage door is of the roll up type, I ended up going for ceiling mount. I worked out a location where the distance sensor could pickup the increased diameter of the roll when the door is open. One question – is there any way to configure the Blynk notifications? I don’t need to know everytime the door is opened or closed, but it would be useful to know (for example) if the door is left open for greater than a certain duration – for instance when I might have forgotten to close the door. You can remove the Blynk notification by clicking on the Stop button to stop the app, then clicking on the notification widget (on the right of Read Cnt), and remove it. This way, you won’t receive notifications. To customize the notification (e.g. if the door is left open for a certain duration), it will require modifying the firmware. This is something we can do in future firmwares. +1 for custom alerts after x minutes. Until then, i will run a script on my computer to check status. Then open for more than x minute’s then will send an email. Phone notification would be better though. A couple of days ago the Blynk app seems to have stopped working with my open garage board. Local direct access to the board web page works fine. Tried changing the cloud key but the Blynk app keeps saying my generic board is not in the network. You can use the built-in web interface to update firmware (click on the ‘Update’ button at the bottom of the homepage). If the built-in web interface is not responding, do a factory reset (i.e. pressing the button for 5 seconds or more), then follow the setup steps but leave the cloud token empty. If it doesn’t succeed, try to power cycle the controller and try again. If that still doesn’t work, you can use a USB cable with esptool.py to update the firmware (instructions can be provided upon request). After putting in Blynk token, make sure the Accessibility is set to ‘Direct IP + Cloud’, otherwise the controller won’t communicate with Blynk server. It worked great. Was able to download the binary and update the opengarage entirely from my phone using the web page and confirm that the Blynk app is working again. Did you figure out what Blynk changed that broke it? I am not sure what broke it. I did read that it requires updating Blynk Arduino library to the most recent version, which is what I did. I haven’t followed their forum post to find out what has changed. Congratulations for the project. It’s really neat! I want to test it with a wemos mini D1 and I’m trying to compile as I will need to adapt it to a solution for 2 doors controlled by a set of relays for the two motors. I’ve tried to compile it with Arduino IDE and I get several errors all related to the Blynk library. I’ve updated the the Blynk library so since I’ve seen your note at the beginning of the blog regarding to a new firmware, I was wondering if the the source code needs to be updated to be used with the new version of the Blynk library. any hint of where the issue could be? Your error message seems to be incomplete: it says ‘multiple definition of’ but I need to see multiple definitions of what? The reason is that OpenGarage firmware manages WiFi connection itself while Blynk library doesn’t provide a suitable function to allow this. So I added a function to allow it. Just got and installed it on my garage tonight. It’s great! It works so much better than the remotes. One suggestion for future firmware: a report of WiFi strength (if possible). It took some fiddling to get it to connect in my garage. Also, is it intentional that one has to long press the door button on the Blynk app? If I short press or tap, it seems like the relay does not stay on long enough for my door. Otherwise, great tool. Couple this with the OpenSprinkler and my house gets smarter! WiFi strength: yes, this is definitely possible as the WiFi chip’s API function does provide this data. Currently the Blynk button is set in ‘push’ mode, which means the duration of the signal depends on how long you press it. This simulates physical button where it depends on how long you have pressed the button. However, in case of Blynk, if you press too quickly, it might not have enough time to send the signal to the controller. The alternative is change it to ‘switch’, which makes it a toggle switch, but it’s not really suitable here. Thanks for the feedback! I’d suspected the Blynk app had some sort of limitation there. I had been playing with its setup and noticed that buttons were push/toggle but didn’t go much further as I didn’t want to break it. So far, it has been great! It works every time now that I have made my self used to the longer press in the app. Which is far better than the remotes that came with the garage door opener. I tell my friends and family about it often! Thanks! Same here: the remote in my car is so not working that I now use my phone exclusively. Thanks for sending over the product last week. I had it working but for some reason the unit is not opening my door anymore. I checked the soldering on the buttons and they seem fine since when i connect the two wires my door opens. Any ideas? Reboot and factory settings did not help. let me explain somemore what i did. I soldered two wires to my garage remote which works wireless. When i connect the wires to eachother the door opens.. But when i connect the wires to the OpenGarage unit via the orange plug the unit will not open the door. The first thing to check is to hear if the relay clicks when you either click the button on OpenGarage, or use the web interface to trigger a button click. If the relay clicks, the next thing to check is the connection from OpenGarage to your remote. Ray, i just realized your using the zener diode and a resistor as a voltage divider, i think i have it figured out now. You are right, the 3.3V zener diode serves as a level shifter. I just bought the opengarage door, and it works as expected with the html page. This is my first time using Blynk and setup a local private server on my rasp pi, and as I assumed, it doesn’t connect to the Blynk app. I am assuming you are pointing to the cloud version, not local. I was looking through the repo and cannot locate the lines I would need to change, to have it point to my local Blynk server, and not the cloud version. You are right — by default it connects to the Blynk server. If you want it to point to your local server, you need to modify the firmware — specifically the Blynk.begin method, by providing the IP (or domain name) of your custom server. I got the OpenGarage today, thanks. I added the Blynk app to my iPhone. I got the OpenGarage connected to my network. I can see the web interface on my network and it changes as the distance sensors change. I scanned the QR code and Blynk shows an OG app. But, Blynk does not seem to be connected to OpenGarage. When I move the sensor, nothing changes on the Blynk display. What did I miss? I read the documentation but I can’t figure it out. 2) make sure the ‘Accessibility’ is set as ‘Direct IP + Cloud’. Once the above 2 are set, reboot OpenGarage and it should connect to Blynk. Ray, I got it to connect and I get messages when the door opens and closes (I simulate this). The browser interface works over my WiFi network. But, the Blynk app on my iPhone is not doing anything at all. The button doesn’t work and the other widgets don’t change or do anything. I have it set up as you said. Maybe I should just start over again, reset the OD and set up a new Blynk account? Sure, you can try that. To reset, just press and hold the button for more than 5 seconds, and the LED will stay on, at which point you can release the button and it will reset back to AP mode. During set up, you can fill in the Blynk Auth Token. Another thing to try is to use a different mobile device (for example, if you have an Android device) to just see if the Blynk connection issue is reproducible on other devices. Good idea. I have an Android pad I can try. I uninstalled the Blynk app from my iPhone, reinstalled it and everything linked up as it was supposed to. I probably fat-fingered something, but it is working now. I am going to install it on the door tomorrow. I noticed that my when I try to connect it to my network on my 192.168.4.0/24 wireless network the unit crashes. It wont let me browse to the ip my router has assigned it. When I reset the unit, and connect it to my 192.168.1.0/24 network there are no issues. Has anyone had this issue? I am stumped. I really want it on my 4.0 network. I don’t understand the /24 part of 192.168.4.0/24 — could you explain? /24 means my subnet mask is	255.255.255.0. Every time the device connects to my 192.168.4.0 network it goes into some freeze and wont let me in. I have to restart it. It is on the newest firmware update. I have no issues adding it to any other network. I wonder if this has to do with the fact that 192.168.4.x is the chip’s default AP mode network IP. As you know, when it starts in AP mode, itself has an IP address 192.168.4.1, and any device connected to it has a DHCP IP of 192.168.4.x. This is really the only thing I could think of. It is the default AP mode network Ip. I tried several different ranges. Everything works except the 192.168.4.X. Keep this in mind if someone has issues. I just had to move my whole IOT network range to make this work. I am happy with it though. Received mine overseas from Ray. Just had a few hours to get it all wired up and integrated with my OpenHAB. Very happy with the end result. A) Can now tell when a vehicle is inside or not and use that data point for further actions. B) Single click “Disarm Alarm + Open Garage Gate” from my OpenHAB app. C) Was able to mount a wall mounted garage door button in our garage since I already have a 433.92 bridge. Yes yes, the Raspberry PI + Tellstick Duo 433.92 bridge double checks the alarm is actually fully disarmed before popping the door open. Wouldn’t want someone cloning the button and opening the gate at will. D) Previously I was using (and continue to, to some degree) our alarm system to read the gate open / closed status. This would well, but due to reasons out of my control, there is a bit of a delay between when the alarm will publish the open / closed status. I now use both the alarm and the OpenGarage sensor. So there is a chance that the OpenGarage sonar will have the data for me a bit quicker then the alarm system. Overall I can highly recommend this to someone looking at a low cost and feature filled garage door home automation device. Well packaged and Ray clearly has put some thought into the whole project. Even has a buzzer which I’m sure it could have done without. And not lost any + points from me anyways. The only downside I can see to it is the ios / android app. Although this does not affect me in the slightest as I would have integrated any one of these types of devices into my OpenHAB setup, but essentially that would be the ONLY reason to go out and purchase (at three or more times the cost) any commercial / retail system. Thumbs up Ray! Bookmarked your site, will keep an eye open every little while to see what you come up with! Thanks for your feedback. Glad to hear you have been able to use the device with OpenHAB. The buzzer was added because a customer told me that all unattended garage door remotes / buttons should meet the new UL 325 standard, which requires having an audible alarm. I am planning to order the open garage, but I have 2 garage doors and just want to verify I can set run 2 doors before I order. How do I set up 2 doors in the Blynk app. Am I correct that I will just set up 1 project for each open garage (each door)? Hi Mike: you are right: each OpenGarage can only operate one door, but you can have two separate OpenGarages, one for each door. In Blynk app, each project has its own unique token, and you can have duplicate projects, so it works fine — albeit a bit awkward since you need to switch between two different projects, but it’s pretty straightforward. Also, you can change the project name for each to help you easily identify which is for which door. Regarding the native web interface: each OpenGarage will have its own IP, so you can individually access each (and similar to above you can give each a different name). Hi, on the forum users have reported mixed results. The main issue is that RPi 3 can draw a large amount of current that exceeds the design spec of OSPi. 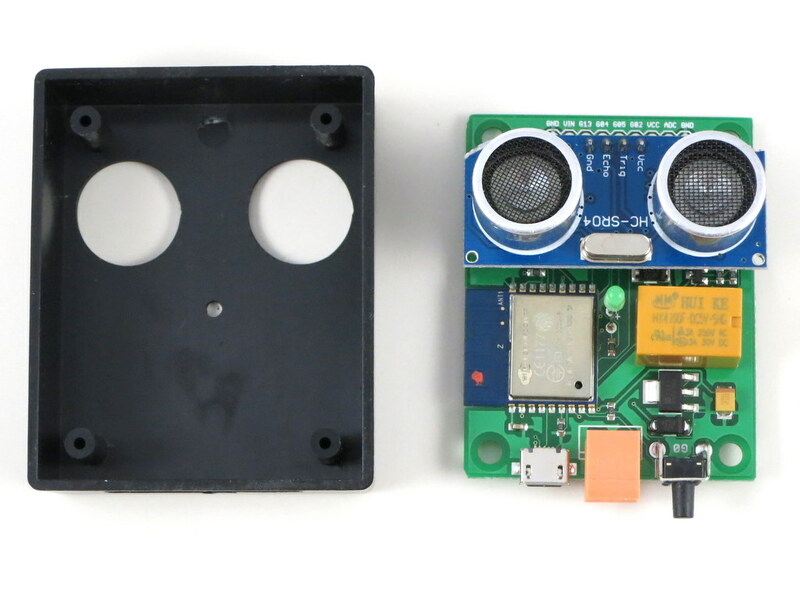 If this is the case, the work-around is simply to power RPi 3 separately with a USB adapter. This way, RPi 3 will draw its power from the USB adapter instead of OSPi, and should fix the power issue. Just got it in the mail. Unfortunately, it wont work for my use case. I am not willing to pay blink $1 and all I wanted was for it to close itself overnight if I leave it open. which it does not do natively. Can I add this feature to the device? The code is python and jquery? If I flash bad settings to the device what are my recovery options? Hi, the Blynk app is for remote control — if you are away from home, you can check the garage door status and trigger action if needed. The firmware is written in C++ and is publicly available on Github: https://github.com/OpenGarage/OpenGarage-Firmware. I finally got around to installing this. 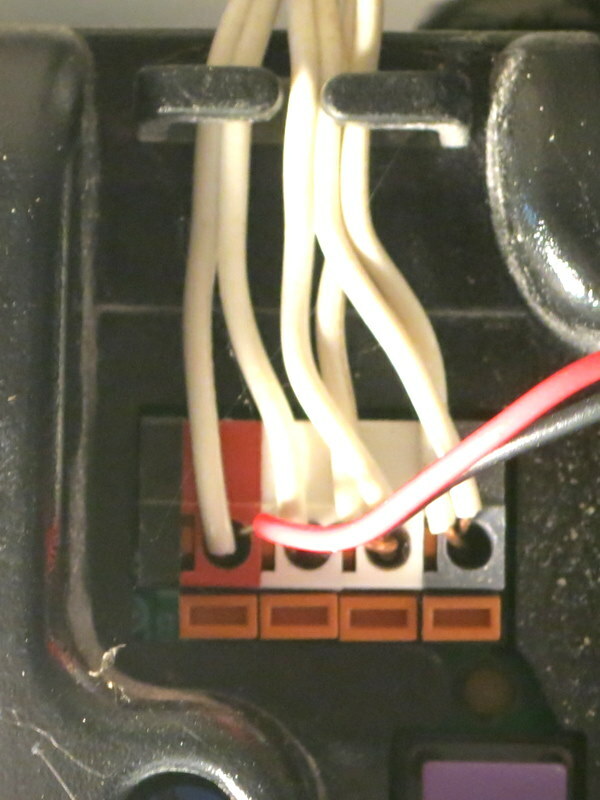 I don’t know if anyone else ran into this problem but my garage door opener “brain” is quite a bit further away than the supplied cables to reach the OpenGarage module. The USB cable barely reached my mounting point. I tried to mount it as close as possible from where the garage door opened up all the way to an overhanging beam. Anyway the supplied wire that connects to the relay was way too short for me. I ended up cutting up a spare CAT5e cable that was just leftover cable from an install to get the required length. Sorry to hear about the cable length issue. The cable length is generally sufficient for most garage door systems, because the distance from the opener (the ‘brain’ you said) to the edge of the garage door when it’s fully open is well within 4 to 5 feet. For future reference, you can always contact us for technical issues and we will be happy to provide you a longer cable and wire to fit your need. Thanks. I installed it Friday and it operated fine Saturday to my knowledge then come Sunday I had issues with my cars intermittently stopped working with HomeLink and also remote controls that came with the garage door opener. I eventually replaced my CAT5e cable (too brittle when stripping the core) with speaker wire and moved the shared connection from the switch on the wall to it’s own connection. Would seem odd that I would have problems shortly after installing and something that should affect wireless signals. I’m running Android, is there some way to change the default notification sound to a custom sound within the Blynk app? I’d like to distinguish a sound just for garage door opening and/or closing. I am not sure how to change the notification sound. I don’t think Blynk app itself provide such an option, but you may want to check system settings to see if there is away to assign a different sound to each app. I’m using Mac OSX by the way. Did you put the OpenGarage folder into your Arduino’s library folder? The error message sounds like Arduino is not detecting the OpenGarage folder. Will OpenGarage connect to Wifi with WPA2-Enterprise (802.1x) sign-on or a method to connect Ethernet. I don’t think so. It currently only works with WPA2-personal (not enterprise). I would love to use this on my electric gates for my driveways. Has anyone used this product for an electric gate? The product is basically made of two parts: a sensor that senses the status of the door, and a relay that triggers garage door action. I am not familiar with electric gate, but as long as the status of the gate can be detected using the ultrasonic distance sensor, and you can interface with the gate opener via a simple button (or a remote), it should work well with OpenGarage. 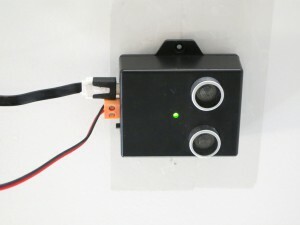 Mount the sensor at a location where it “looks” horizontally, towards the garage door, but from a position in-line with the upper tracks of the door, and far enough away from the door so that when the door is fully opened, the sensor is just behind the fully opened door. The sensor would be looking end-on to the door when the door is open (looking at the “top” end of the door which is now horizontal when the door is open). The reason to do this is to allow the sensor determine just how much the door is open, and provide a means of opening the door partially, and sensing that condition. Would be great for OpenGarage to be able to automatically open the garage part-way, know that it is in that state, and then properly close it when commanded. We sometimes leave our garage door open enough to allow the cats in and out, or for ventilation. 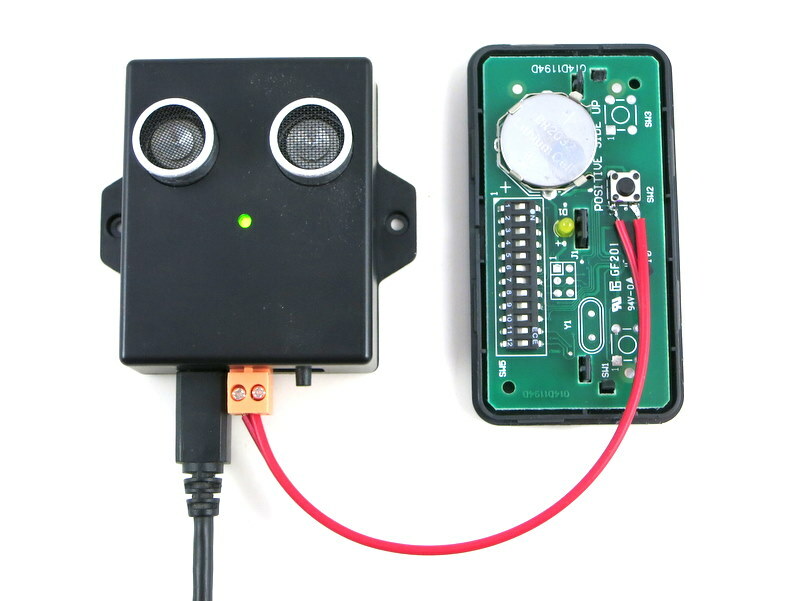 Another feature which would be nice to have on the OpenGarage device is a way to piggy-back off of the optical sensor which the garage door uses for safety. This would be useful to allow OpenGarage to report the status of the sensor back to me when I’m trying to control the door remotely, but don’t understand why the door isn’t obeying my command to close. Good suggestion. Though I don’t think the distance sensor has a small enough angle of ‘view’ to provide the accuracy when it’s facing the side of the garage door. Because of the way ultrasonic waves work, it can only sense relatively large objects (I think the angle of view is about 15 degrees). So if the object it’s sensing is small (say, the garage door is not that thick), then as soon as the object moves a bit further away, it can’t sense the object anymore. So I think this method will only work if it uses a optical based sensor. I love the project but I’m not a coder. I’m really looking for something that will automatically close my garage door at a time I set. I can’t tell you how many times I have left my garage door open on accident all night. I know a lot of people have this problem. We have had anything from animals coming into the garage to stuff stolen, peoples houses have been broken into. SOMEONE PLEASE! 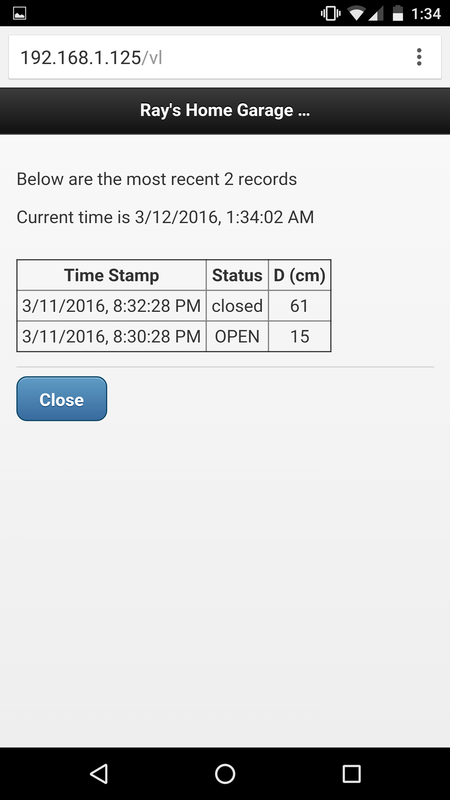 code a timer to close it at a specific time of the night. This is on todo list to be introduced in the next firmware update. Thank you for your OpenGarage project and the fact you set it to be open source. I have it running on a NodeMCU with just the ultrasonic sensor. Wife is not wanting it to remote control the door yet with a relay. Had a few issues with Arduino IDE and the code, but yur force search got past them with missing library and such. Question about the option you have on the OpenGarage web interface for IFTT. Do you have a doc, or weblink that covers setting up IFTT and the OpenGarage to send a SMS text if garage is open for X minutes? Wife does not want another app on her phone (Blynk), and the notifications are not working on Blynk for me . I’ve been using both OpenSprinkler and OpenGarage for 12 months now and very happy with your products. Thank you. I had an issue with the OG where it randomly goes offline, then comes back online. I reset the device several times, reflashed the software all to no avail. I then noticed that the Micro-USB cable connection seemed to slightly shift at the connector to the board. I opened the case and discovered one of the anchor solder joints was loose! No problem I can fix this by soldering power leads directly to the board. I’ve also been experimenting with IFTTT and I’m really happy your devices are compatible. I also just discovered the option of connecting a flow meter to OpenSprinkler! I thought I would have to build a custom solution for this! Thanks for supporting our products. Sorry about the microUSB connector issue. If the issue persists, you can contact us and get it replaced. I am not sure. Maybe you didn’t select the correct board? The board should be ESP8266, not standard Arduino. 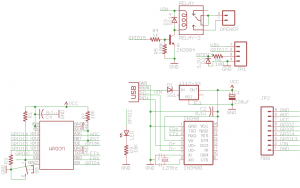 You need to install ESP8266 core for Arduino, as the instructions state. 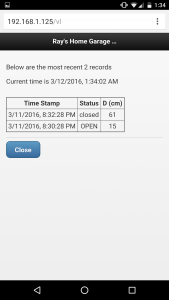 C:UsersgurjinderAppDataRoamingArduino15packagesesp8266hardwareesp82662.2.0coresesp8266. now i getting the different error. please let me know what i am doing wrong. This is likely due to ‘BlynkSimpleESP8266.h’ included in multiple places. Go to examples/ogMainArduino/ogMainArduino.ino and uncomment the include BlynkSimpleESP8266.h line there, then try again. I have tried inputting the configuration above into openhab2 but have not had much success. Does anyone have any advice for this? Sorry, I am confused: what ‘above configuration’ are you referring to? Thanks for your great work. I put together my own OpenGarage device with an esp8266 dev board and HC-SR04. I have an issue where it seems to reboot every 60 or 120 seconds. I have tried a second 8266 dev board thinking it might be a hardware issue and got the same result. Would you know what might be the cause? The HC-SR04 sensor must be connected correctly, otherwise the firmware will time out when reading the sensor and trigger a watchdog timer reset.